Welcome to the all-new Hookit! Over the past few months, we’ve talked to hundreds of members — pros and amateurs from every sport — and took your feedback into account to create what we hope is the ideal website for your sport. Things might look pretty different around here but you can still do a lot of the same things you could before like posting events, sessions, photos and videos and even applying for brand support. We’ve just made it all way easier to do. Your Hookit Score. Measures your commitment, performance and reach in your sport. It updates daily from hundreds of verified sources. See How You Stack Up. Track, monitor and compare your Hookit Score against friends, competitors and pros. Eearn Exposure & Deals. 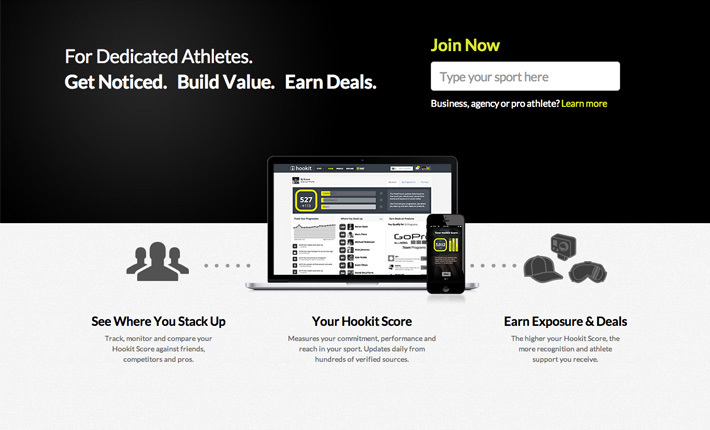 The higher your Hookit Score, the more recognition and athlete support you receive. Finally, check out that new navigation bar at the top. From there you can easily post sessions, photos, videos, events, results and your status update. You can also explore the site to find other athletes, brands, events or spots. We’re stoked to share the new site and mobile app with you. If you have any feedback or problems, email us at feedback@hookit.com. We’ll continue to work hard to make Hookit the best platform for you and your sport.